n 2004, SASS purchased a rustic 480-acre ranch in the rolling hills 20 miles east of Albuquerque, New Mexico where it is building the world’s premiere Cowboy Action Shooting facility. Christened Founders Ranch in honor of those who founded SASS, the ranch is a one by three-quarter mile rectangle surrounded by a seven-foot game fence containing a small herd of American buffalo and several longhorn cattle. Located six miles off Interstate 40 at the top of the grade east of Albuquerque, Founders Ranch has its own roads, a good well, and ample electricity. The property also contains a three-bedroom ranch house and a 1500 square foot steel barn. The facility includes a state-of-the-art twenty bay shooting range, camping pads for up to 600 recreational vehicles, parking for up to 4000 cars, as well as a weather proof road network. The center piece of the shooting facility is a functional Western Town replica opposite the shooting range used by SASS and its sponsors and vendors. An equestrian center is located at the northern most portion of the ranch which includes a 150 by 300 foot arena. The SASS Web Site at www.sassnet.com receives on average 1.5 million visits per month and continues to grow. The Cowboy Chronicle now prints over 30,000 copies and supports advertising from more than 150 advertisers. SASS has made an effort to bring support from not only those in the shooting industry, but from the non-shooting arenas as well. SASS continues to produce END of TRAIL, The World Championship of Cowboy Action Shooting and it is still our flagship event, taking place every June at Founders Ranch, New Mexico. 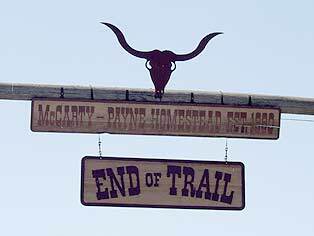 END of TRAIL, the granddaddy of all Cowboy Action Shooting events regularly hosts over 1600 competitors and conventioneers with more than $250,000 in sponsorship support. On average some 25,000 spectators and participants attend the annual event. 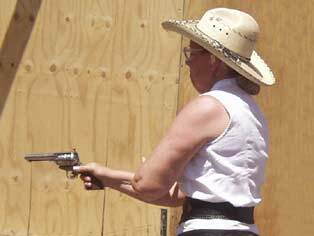 END of TRAIL, however, is not the only major Cowboy Action Shooting event. SASS has more than 500 affiliated clubs, the majority of whom present annual multi-day events, some having escalated to proportions once never imagined. SASS has come a long way since its origins back in 1981. It has become a direct reflection of the membership who join with heart and vigor expanding and keeping alive the Spirit of the Game. SASS must give credit to many individuals and groups who have contributed to the growth and direction of Cowboy Action Shooting. The bottom line however is SASS members are what make the organization and The Wild Bunch is determined to lead, and at the same time, follow the direction our great sport is taking us.